I need a way to share sensitive financial information online with colleagues in a collaborative spreadsheet format on my office's password-protected internal website. Benjamin has a limited office budget and obviously cannot have [secret] company information posted to all Internet users. You can either use Google Spreadsheets or Zoho Sheet for sharing spreadsheets securely with your office colleagues. Either of these allow you to share data privately meaning the data is visible only to the invited users and not to anyone else. Here's the general workflow - you upload your Excel spreadsheet to any of the Web Office suites, click the Collaborate tab and just type the email address of your colleague with whom you want to wish to collaborate on the document. Both products are equally good with few minor differences. Google Spreadsheets won't work with Opera browser while Zoho Sheet will. 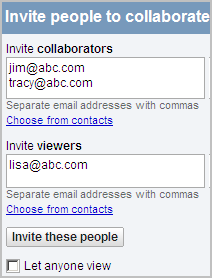 Also, invitees are supposed to create a Google account in order to view or edit the shared spreadsheet but with Zoho, sign-up is only need for editing, not viewing the sheet. What you will probably love about Google Spreadsheets is the way it enables multiple users to collaborate simultaneously on the same spreadsheet. Users can simultaneously work on the same spreadsheet and see the changes made by each other in real time. They can even text chat with each other inside the spreadsheet webpage which makes it all the more useful.